This year, two beautiful picture books about black ballerinas hope to dance their way into children’s hearts and hands. The latest is a gorgeous forthcoming debut by American Ballet Theater soloist Misty Copeland titled Firebird, the name of the classic role she was the first black woman to star in. Published by G.P. 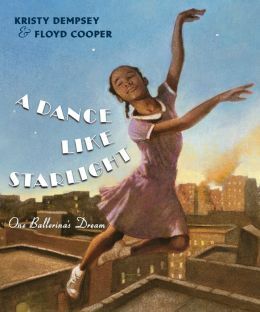 Putnam’s Sons and illustrated by Caldecott Honor artist Christopher Myers, Copeland’s work is a love letter to a brown girl who dreams of being a dazzling dancer too. To lift the child, who sees a “longer than forever” distance between herself and her idol, Copeland reveals her journey from ballet dream to determined realization. In a stirring marriage of poetic words and poignant images that affirm and encourage, Copeland and Myers create an evocative landscape in which a new generation of young dreamers and dancers can take flight. The book is available for pre-order now and releases on September 4. In January of this year, another moving ballet story began weaving its magic. A Dance Like Starlight: One Ballerina’s Dream (Philomel), written by Kristy Dempsey and illustrated by award-winner Floyd Cooper, tells the story of a 1950s Harlem girl inspired by first black prima ballerina Janet Collins. Like Firebird, the text and illustrations are lyrical and full of heart and movement. But in this historical fiction tale, a girl whose mother works as a seamstress for a ballet school is immersed in the world of dance and dreams of being a prima ballerina. Seeing groundbreaker Collins perform at the Metropolitan Opera turns her dream into something more – a vision of who she can be. Janet Collins Animated Film: Karyn Parsons (Hilary on the Fresh Prince of https://www.youtube.com/watch?v=ogAU_ndQRaABel Air) launched a campaign to raise funds for an animated short film called The Janet Collins Story that would be produced by Parsons’ company, Sweet Blackberry. Check out the campaign here. Great news: It was fully funded. Now, we can look forward to a wonderful film for children about Collins. 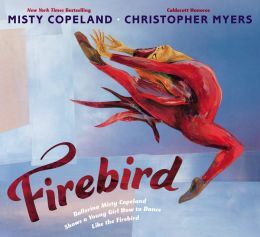 Wouldn’t it be cool to share Firebird, A Dance Like Starlight and The Janet Collins Story with kids you know? I wasn’t the kid who wanted to be a ballerina, but noticed last year the remarkable number of ballerina books debuting with Caucasian main characters – I thought back to BLUE TIGHTS, by Rita Williams-Garcia but am SO GLAD to see more. I took ballet from the age of 3 to 17, and I would have LOVED these books with characters that look like me! It’s never too late, though. I’ll be buying them as an adult for my personal enjoyment AND to support these authors and illustrators. Thank you for being such an inspiration to children and writers alike. There is such a great need for more diversity within children’s literature that is centered around black culture. Kudos!